Thanks to all who participated in Showbie’s #ShowbieAndTell Twitter Chat on Thursday, January 17, 2019! 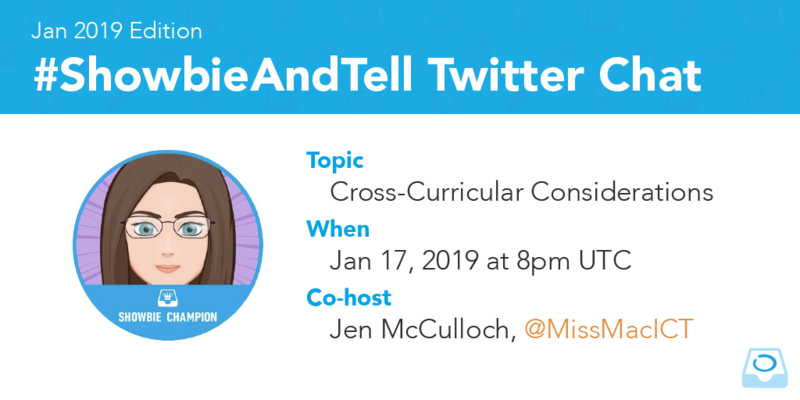 Showbie hosted a Twitter Chat with Showbie Champion Jen McCulloch around the topic of “Cross-Curricular Considerations”. Below is a curated version of the Twitter Chat with Jen McCulloch. Which software or apps do you use to teach cross-curricular subjects? How does your school manage cross-curricular use of various apps? How does edtech enable teachers to evidence student work in cross-curricular lessons? What is your edtech New Year’s resolution? A2 #ShowbieAndTell My role is to implement the digital curriculum across our Early Years – Year 8 it started with the need for digital skills not being implemented that made it difficult for teachers to implement tech in their lessons.